The tomato ingredient lycopene may be associated with a reduced risk of prostate cancer but is unlikely to make a significant difference on its own, scientists say. Men with a high intake of lycopene may benefit from a slightly reduced risk of prostate cancer, new research suggests. 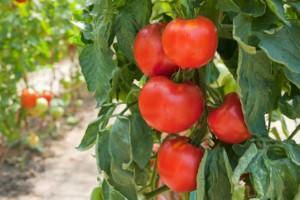 Lycopene is an antioxidant carotenoid pigment that is found in certain plant foods, in particular tomatoes. A number of studies have suggested a link between lycopene consumption and protection against prostate cancer, and the latest research from Sichuan University in China indicates that there may indeed be a small association. Researchers at the university's West China School of Public Health searched through published medical literature to find previous studies evaluating lycopene and prostate cancer risk. They identified a total of 17 studies for use in the review, all of which had looked at whether or not men's intake of lycopene and tomato products influenced their risk of developing the disease. When the researchers combined data from these studies, they found that men who consumed larger quantities of raw tomatoes, cooked tomatoes or the ingredient lycopene were slightly less likely to be diagnosed with prostate cancer than those who rarely ate these foods or used supplements containing lycopene. Publishing their findings in the Journal of Nutritional Science and Vitaminology, the study authors concluded that tomatoes - and in particular the ingredient lycopene - may play a "modest" role in the prevention of prostate cancer. "Further research would be needed to determine the type and quantity of tomato products regarding their potential in preventing prostate cancer," they added. The researchers also noted that eating tomatoes or taking lycopene supplements on their own is unlikely to be sufficient to help prevent prostate cancer and emphasised that men should still be advised to eat fruits and vegetables to help reduce their risk. Men with prostate concerns may want to consider using a supplement such as AlphaProst Plus, which is supplied by Really Healthy. This high-quality food supplement contains lycopene alongside a host of other nutrients with benefits for prostate health, reflecting the fact that lycopene on its own is unlikely to provide optimal results. Other ingredients that make AlphaProst Plus so beneficial for prostate health include saw palmetto, nettle and pumpkin seed extracts and various plant sterols, all of which work synergistically to provide enhanced benefits for the prostate.